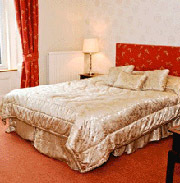 Our hotel is based on the outskirts of Burntisland, 4 miles west of Kirkcaldy, in the Kingdom of Fife. Nestling in over 2 acres of gardens and woodland, uniquely situated to allow panoramic views of the Firth of Forth to Edinburgh. Our superb location and genuine hospitality ensures that many of our customers have become familiar faces. So whether you are looking for the hustle and bustle of Edinburgh, a base to explore the unrivalled beauty of Fife, to visit our restaurant or even in search of a Wedding Venue – you are guaranteed a warm welcome at the Kingswood Hotel. 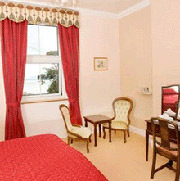 You will find each room individually decorated and equiped with a range of toiletries, colour television, radio alarm, trouser press, hairdryer and tea & coffee making facilities. Some rooms have their own balcony with a wonderful sea view. Family Suites and a ground floor bedroom suitable for disabled guests are also available. For that special occasion, we even have a luxury four poster bed. For a quiet midweek or weekend break in the country by the sea, Hotel packages can be tailor made to meet your own particular requirements. A variety of activities including Golf, fishing, clay pigeon shooting and off road driving can also be arranged to help make your stay particularly memorable. Our Executive Chef Mr.Mark Whiteman, heads our established kitchen team.With his wealth of knowledge and experience in developing interesting and varied menus offering both Traditional Scottish and Continental dishes, It is Mark’s Philosophy to retain the natural aroma and taste of the best local ingredients available, with menus changing regularly.